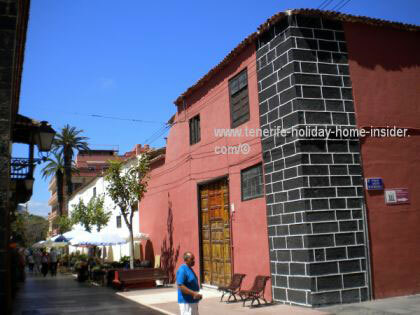 Puerto Cruz Tenerife culture in history, tourism and business. Puerto Cruz Tenerife culture is first to be discovered by its past. Without a historic cultural cradle no culture may be nurtured. However, the town's latest cultural news should have priority. News 2014 In fact, on May 28th, the Tenerife's newest library the Biblioteca de Tomas de Iriarte was inaugurated. It's motto is learning and culture for everybody. 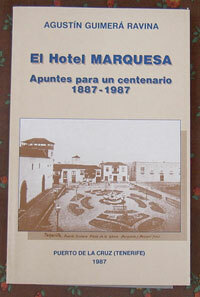 Many cultural events were organized in the past through different owners of Hotel Marquesa in Calle Quintana. I was reading up on this and Puerto de la Cruz history in the booklet called Apuntes para un Centenario 1887- 1987 by Agustin Guimerá Ravina. This hotel alone is proof of past and present Tenerife culture. Men like Alexander von Humboldt, indeed, stayed at this Puerto de la Cruz hotel as a guest. The biologist and philosopher admired not only nature, but also Puerto's cultural ways of life. The Mueca festival of art of Puerto, El Puerto or Puerto Cruz, as the locals call Puerto de la Cruz, sums up most of the town's passion to express itself by art and cultural activities. 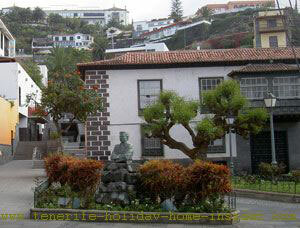 Not to forget in this context is its carnival which comes second after that of the Tenerife capital. 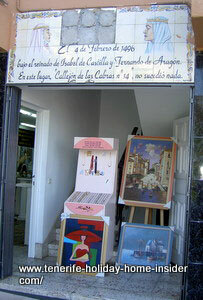 The photo beside is of the art cafe in Calle Mequinez, It's in the trendy hub of restaurants of Puerto de la Cruz. This amazing 'Ranilla enclave' which reach within one minute on foot from Plaza de Charco is favored by down to earth fishermen, fishing fans, visited by lovers of good food, art, history and culture and walked at leisure to and from Playa Jardin. Music noise pollution of Parque San Francisco? In the past, concerts were held at Park Parque San Francisco. This is an ample, ancient building at the corner of C/Quintana and C/Betancourt. Its major renovations have been postponed again in 2014. It remains to wonder how the center's noise pollution problem will be solved in the future. 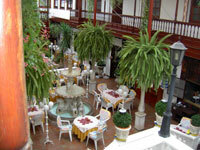 Its well maintained building is in C/Quintana close to Parque San Francisco. It faces market stalls where flowers and plants are sold and where folklore street musicians perform occasionally. It's an international culture center of learning where seminars invite for expat and foreign participation. It has its own collection of books. Viniculture or Viticultura in Spanish is all about the culture of growing grapes and about producing wine. In this context, discover another huge, old house which is in dire straits for repairs. It's called Casa del Pueblo. Encounter it when you proceed along Calle Vieja from Plaza del Charco. In 2009, works took place inside but, were stopped again. I was there in 1997 during a wine tasting event. Now, its cultural events of yearly prize givings to top wines take place in Puerto's Casa de la Aduana between May and end of June. By the way, I find it hard to believe that this place is said to have been a hotel. Its main room rather looks like a glorified large barn with a leaking roof. Above is a video of the last 'Fiesta del Vino of June 14 of 2013' where the display speaks for itself and where 'la Tienda La Ventita' takes part. Should the town library have been moved into Casa Ventoso ? In 2008, Casa Ventoso (House Ventoso) of the early XVIII was marked to become the town's library. The idea was abandoned. Nevertheless, the almost 2000m2 big mansion is again an important cultural center of town. It fulfills many functions. It was used for a creep show called 'House of Terror' and for a crafts fair. The biggest Canary Island exhibitions of nativity scenes are shown there every year. Usually, folk concerts with the famous Sabandeños follow suite as well as classic concerts. However, sometimes local folk music is given priority. Casa Palacio Ventoso merits this second name. The outlay of its rooms follow a good architectural design and the building seems to be fundamentally sound. I noticed this at Christmas 2013 when it was a house of open doors. In early XVIII, it was built by the wealthy Blanco family who was engaged in successful marine trade. Mind that Puerto de la Cruz is said to have handled 80 % of Tenerife's exports at the time. The house was also a college of Augustine monks at one stage. A German consulate used it and later, a bishop lived in it. Torre Ventoso a most elegant tower in Calle Valois. It is a 6 story square stone construction with wooden balconies. Its Grecian white walls are immaculate. Nicolas Blanco built this tower to be the first to spot incoming ships with merchandise that may interest him. In 1812 a 'Declaration of Liberty' was signed in it. 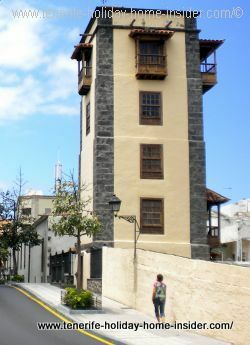 In 1990, it was renovated and was to be opened for tourism and culture of Puerto de la Cruz, as was affirmed early in 2008. However by 2014, this still has not happened. Casa Iriarte museum facing Casa Ventoso. Surprising is that nobody in Government thought of a face lift for Casa Iriarte, the museum in dire need of restorations right opposite Casa Ventoso in Calle Iriarte. It is said that its building is privately owned. 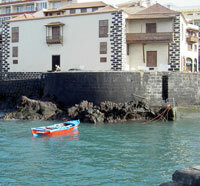 Casa Iriarte is part of culture Puerto de la Cruz. The famous Iriarte brothers merit a better museum for their fables and illustrations.. Forget about the culture related 'Plan de excelente Turistica' with proposed spending of 5 Million GBP. It is yesterday's snow. 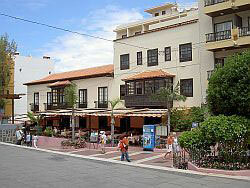 Renovation of Rambla del Castro, as walking and hiking is one of the cultural activities in high tourist demand. The remodeled beach front San Telmo a success story, except for more vulnerability by incoming waves. 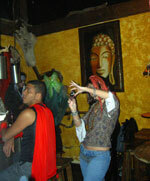 Continuously changing cultural events at Hotel Maritim on the border of Los Realejos Puerto Cruz. 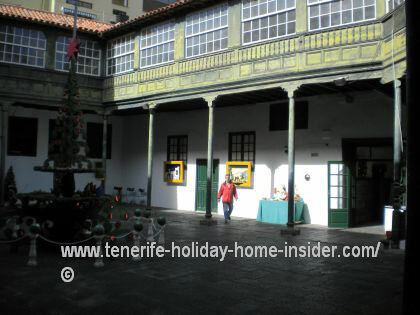 Besides, hotels may also publicize the town's events in their lobbies to bring Puerto Cruz Tenerife culture to tourists. Altar of church San Francisco Puerto Cruz. Architectural exception: Both Church and Hermita are connected. Serving: Today this temple is used by different congregations of different European nationalities. Its arts: From the 16th century and later added on treasures. Indeed, the rather prominent art scene of Puerto de la Cruz owes much to Eduardo Westerdahl who was also internationally renown as you may read up here. A tribute to women monument to Puerto's Fish wife women has been erected in 2008 a few meters from it. The sculpture by Julio Nieto belongs to Puerto Cruz remarkable street art. Passers-by look at the dark bronze sculpture in astonishment. Purpose: To fend off pirates for Puerto de la Cruz merchants and ships. In December 2008, I attended a Christmas concert at this Center. It is on the grounds of the former Hotel Taoro and later Casino. All is being maintained but is not open to the public. Iglesia Peña Francia Puerto Cruz Tenerife. The church Iglesia de Nuestra Señora de Peña Francia on Plaza Iglesia, 2 (tel 0034 + 922 380 051 ) 0034 is the biggest of Puerto de la Cruz with 3 naves. 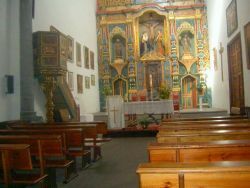 Its earliest version came into being almost a 100 years after the San Francisco chapel of Puerto Cruz. The Irish community built its altar for the sailor patron Saint Patrick of the Emerald Isles. Today, the church Peña Francia is almost perceived like the town cathedral. It's lovely bell tower which is stroked by the white flowers of very tall Oleander trees that move in the wind was added in 1898. Noteworthy cultural happenings in form of classical concerts, some of which are Barroque. Some of the locals pay regular visits to the Orotava and others to the Puerto de la Cruz cemetery which are not like their North European counterparts. But flowers prevail everywhere. Some stone monuments and sculptures are part of them. Notice in this context that the Anglican cemetery is called the Chercha which is almost opposite the Puerto de la Cruz stadium. Church San Telmo Puerto Cruz Tenerife. Built: in 1780 by a group of merchants. Renovated by a German Interior decorator with a vivid appealing color scheme and enchanting details. in Guachinches, more of which learn here. Hotel Marqueza front in Puerto Cruz. Hotel Marquesa for Puerto de la Cruz tourist accommodation which played a major role for its town's culture and development, even for the lower classes. Hotel Monopol the former birth house of Agustin de Bethencourt y Molina (1758-1824) which became another Puerto Cruz historical hotel and which prides itself of a culture of its own. 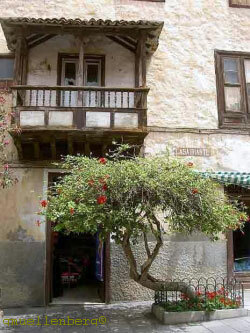 who was a much loved Mayor of the town, a writer, historian and whose beautiful birth house in Calle Blanco is now for sale. Many international art exhibitions are given at Castillo San Felipe, Playa Jardin, Avenida Colon to contribute to Puerto Cruz Tenerife culture..
Art exhibitions for painting, drawing and photography to further local talent is often financially helped and organized by Caja Canaria. This is a financial institution with central seat in Santa Cruz. Information for painting artists may be received, there. Best Puerto de la Cruz art gallery since 2011 has been the Manufactum by the Italian artist Giuliano Montisci. Discover his Tenerife exhibitions and find Puerto Cruz art shows' updates. Montisci's designer flair of unusually artistic real gallery furniture is remarkable. The town of La Orotava's former port made its mistakes. It should never have replaced its authentic fishermen houses with apartment blocks of the 70ies an 80ies period which were also built at its outskirts. Remaining are only those of the old quarters la Ranilla and Punta Brava, besides the more stately mansions here and there. Today, it is proud of what's left of its historic and historical architecture and thrives to maintain it in good condition. Puerto de la Cruz doesn't hold horse races any more, as was the case in the XIX century on the Sortija of Taoro. However, every year Feria de Caballos races take place on asphalted roads between Los Realejos Alto and Cruz Santa on Dia de Canaria at the end of May. No more bull fights either, contrary to mainland Spain. Discover interesting proof of environmental awareness which is expressed by graffiti and eco art as well as by street art by Puerto de la Cruz and international artists. Graffiti comes for free and is much more critical and has a message. Street art may only be decorative and is normally paid. of which you find listed in Tenerife celebrations. The cultural care for the environment by artists expressed by street murals. It is fascinating to see what Portugal culture and the Spanish Tenerife culture Puerto Cruz have in common, while much of it is almost dictated by the Catholic faith as well as by architecture, art and history of art to some extent.